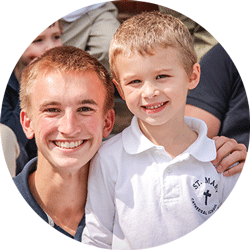 At St. Mary Cathedral Parish and School, we are dedicated to nurturing lifelong discipleship in the Lord, promoting academic excellence, and cultivating God-given talents. Our high school day begins at 7:50 with students in their 1st-hour classes. There are 7 classroom changes throughout the day where students rotate between the core courses of Religion, English, Math, Science and Social Studies, along with Spanish, Physical Education, Visual, Performing and Applied Arts as well as other electives. During this key first year, students start to pave the way for the rest of their high school career. At this time, grades, test scores and school progress are monitored and recorded and everything counts. Participating in extracurricular activities and pushing yourself shows on college applications, even at this early stage. Freshman get to participate in a wide variety of high school wide activities including Homecoming (float building, parade, football game and dance), pep rallies for various sports, Youth in Government (YIG), Cathedral Players Productions, Band, Catholic Schools week activities, and a wide variety of athletic options. Sophomore year is the time to really buckle down and remember that the grades you get and test scores taken during your Junior year count tremendously towards what college you may be accepted into. Preparing for the ACT/SAT and meeting with the guidance counselor to make sure you’re on the right track is key this year. Now is the time to research your option on dual enrollment with the local community college to start getting college credits built up. 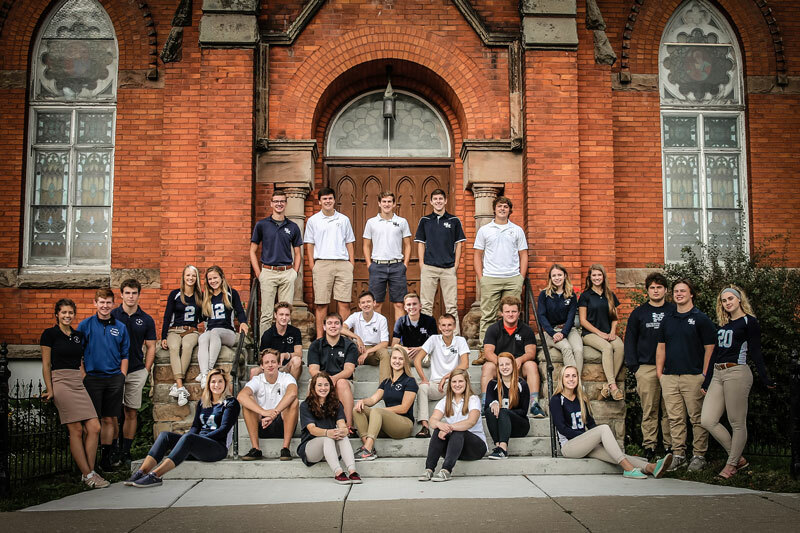 Some things to look forward to during your sophomore year include: Homecoming, YIG, Cathedral Player Productions, Band, Catholic Schools week, and a variety of athletic opportunities. Junior year is all about making those tough decisions and using the resources that are provided to help make those decisions easier. Taking Advanced Placement (AP) courses and signing up to take the AP tests should be considered during Junior year to help cover some future college courses, and making college researching a priority is important. Make sure you’re staying on track to graduate by checking in with the guidance counselor. Researching dual enrollment is always an option this year as well. If you didn’t score too hot on your ACT/SAT, you can think about re-taking those this year too. Some things to look forward to during your junior year include: Homecoming, Prom, YIG, Cathedral Player Productions, Band, Catholic Schools Week, and a variety of athletic opportunities. The Junior class (and their parents) are also responsible for preparing and serving the seniors at their Baccalaureate dinner in May. Senior year is one of the most important years for high school students. Colleges will check final grades so making sure you are meeting deadlines, scoring well on tests and keeping up with your extracurriculars is super important. You should be applying for colleges in the fall if you haven’t already started and looking into scholarship opportunities with help from our guidance counselor. Applying for financial aid is also a very important part of senior. Some things to look forward to during your final year include: Homecoming, Prom, YIG, Cathedral Player Productions, Band, Catholic Schools week, and a variety of athletic opportunities. Special ‘lasts’ for the Senior class include a Senior Retreat, ordering your cap and gown, senior send off, baccalaureate, and last but not least GRADUATION! All scheduled courses must be passed to graduate. Deficiencies in these requirements must be made up. In order to be considered for valedictorian or salutatorian honors, a student must have completed at least six semesters of full-time course work at St. Mary Cathedral School. Total credits needed to graduate: 26. 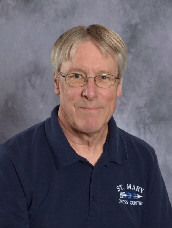 St. Mary Cathedral Parish and School has a full-time guidance counselor dedicated to supporting our students in applying for and learning more about educational opportunities beyond high school. We are proud to say that nearly 99% of our graduates decide to pursue a secondary education, most deciding on community or four-year colleges. In both 2015 and 2017, St. Mary had students accepted and enrolled at Harvard University. An exciting statistic for our small but mighty high school. On average, we graduate between 20-30 students each year. In addition to a robust academic and religious education, students will work together as a class and often as an entire school to engage with our community through service projects. Each month the school focuses on a Virtue of the Month, some include Prudence, Justice, Faith, Temperance, and Fortitude. Each class learns about the virtue and then participates in a service project. Service projects range from leaf raking for our elderly parishioners to collecting for our local food pantry. Additionally, we believe that our students learn greatly from each other. We support a buddy system where our high school students partner with elementary, and our elementary students partner with Young 5 students. Students work with their buddy during masses at the Cathedral and often during various times through the week. Our school is small but mighty, and students of every age engage with each other for a richer, more universal, experience. As a Catholic school, our mission drives our activities. As a result, students are engaged in daily prayer, religion activities and lessons, and daily reflection on our Catholic faith. Our program provides an opportunity for students to be involved in prayer and other religious activities in conjunction with our Catholic Christian Values. For more information about our Parish, please visit our parish website. Check out our JPII room at the end of the High School hallway! Newly renovated and a great space for students to be after school betweeen sports and is used by St. Mary Cathedral Youth Ministry, Cathedral Players and by other groups and meetings throughout the year. Run by parent volunteers, this is a great way to fulfill your family stewardship hours. We believe that communication between our parents, staff and students is vital. Our parents need to familiarize themselves with our student and parent portals. RenWeb is an online student information system used to keep track of the many details relative to the school. ParentsWeb is the online portal designed for parents. We know and understand that being a parent of a High School student can leave you with lots of questions. That is ok, we are here to help! Teachers: All our teachers are open and available for communications, classroom tours, or questions. Office Staff: Our office is open for business Monday through Friday from 7:30 am to 3:30 pm. You may always drop by with questions, comments, or concerns. We are here to help! Mrs. Hatch: Mrs. Hatch is our school principal and works daily to guide our school and students. She is a teacher and administrator and can be a great resource. Please feel free to contact her directly to schedule a meeting or conference. Weekly Emails: St. Mary Cathedral Parish & School sends out weekly emails to parents. This is a great place to get helpful information on activities and happenings at our school. As a parent, you will be automatically signed up for emails during registration. ParentWeb and RenWeb: Our online portals for our students and parents. All of our High School students participate in our school-wide uniform standards. For details on our uniform requirements please click here.